My programme, Chopsticks At Dawn, about chinoiserie clichés in music, is repeated tomorrow BBC Radio 4 Extra & iPlayer. It’s on four times: 6:30; 13:30; 20:30 and again the next morning at 06:30, so no excuses. With musicologist Dr Jonathan Walker. Chinese decorative arts are revered in the West. From Willow pattern dinner plates to the Brighton Pavilion, their designs are regarded as beautiful and sophisticated. But for the past two centuries European composers and musicians have had no qualms about mercilessly parodying what they thought of as ‘Chinese tunes’. The same cliches haunt Turning Japanese by The Vapours, Hong Kong Garden by Siouxsie And The Banshees and David Bowie’s China Girl. They have all followed a pattern set by Claude Debussy, Malcolm Arnold, Albert Ketelbey and Lancashire Linnet George Formby, who were equally guilty of taking Chinese musical motifs and mangling them – or simply making them up! Musicologist Dr Jonathan Walker accompanies Anna on a historical mission, picking out examples on the piano and explaining why and how our western ears hear certain note configurations as “oriental” – from Chopsticks to Chopin. Sadly, I obeyed authority and put away my camera for the toboggan ride. Now regretting it. There’s a lesson in there somewhere. In China for the Bookworm Literary Festival and only a day left in this astonishing city of 30 million, so what to do? You can’t visit Beijing and not see the old quarter, the hutongs, Tiananmen Square and, of course, the vast Ming era (15th century) Forbidden City. It makes a welcome relief from the endless glass and steel towers of modern China. Imagine Canary Wharf. Now multiply it by dozens, going on for miles. That’s what the big Chinese cities look like, even the secondary ones. Lil ol’ Chengdu, nestled in the Himalayan foothills in the middle of the country, has a population of 14 million. Five more than London. Think on that. 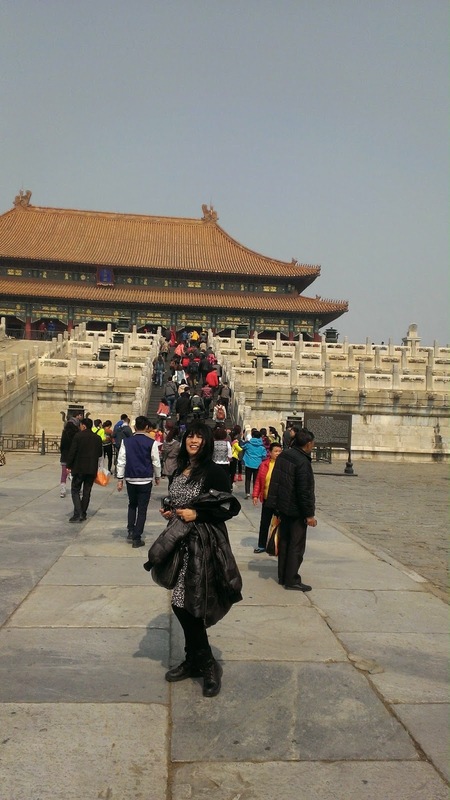 The low-lying Forbidden City and its environs are exactly what these tourists craved. The air may be polluted but the streets are the cleanest you’ll find anywhere, due in part to the government’s Keynsian employment of human beings to sweep the streets with old fashioned twiggy brooms and cute little motorised carts. We were supremely lucky, according to our friends, to enjoy a rare run of blue skies and warm spring weather for our sightseeing. 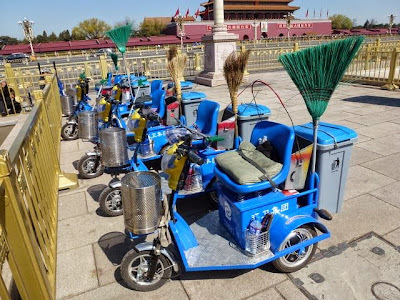 The first time I’d seen Beijing was on a trip with my parents in the 1970s, where everything was Mao suits and bicycles and not a grubby thought to be had. Now everyone has pollution-gauge apps on their smartphones and shops at every familiar western outlet from Gucci to H&M. The fact that the Chinese have any access at all to this beautifully preserved city — now known as the Palace Museum — is fortunate, considering the looting and destruction perpetrated by both the Kuomintang and the Japanese during the first half of the previous century. When I saw it in the 1970s, the painted woodwork was faded, with many of the tiles broken and fallen, and there were few tourists. It’s undergone a transformation as stunning as the Chinese economy. By 4.30pm, when the kicking-out music was played over the loudspeakers, we’d barely seen a quarter of it. You can sense the ghosts of residents past and trace the route taken by emperors borne in palanquins by eunuchs over magnificent stone carvings. Imagine the imperial writhings on the silk beds in the private quarters; hear the pillow talk, the intrigue. What must the palace politics have been like? What must it have been like to be a minion? A concubine? Trapped, never seeing the world outside these dusty red walls for an entire lifetime? It must have felt eternal, as if it would continue for another five hundred years at least. But nothing lasts forever, especially if rulers grow complacent and forget the interests of the wider population. That’s a lesson we’re learning in the West, a lesson that knows no national boundaries. The first movie I stuck on the telly when I returned home? The Last Emperor, natch, shot in the Forbidden City itself by Bertolucci nearly thirty years ago in 1987. Reader, I woz ‘ere! I saw pandas running. I saw pandas rollin’ and a tumblin’. I saw pandas sprawling with a filthy “come ‘n’ get me, boys ‘n’ gurls” look in their over-kohled eyes. I saw marzipan pandas and made short work of them. I saw flaming pandas off the shoulder of Orion. And, yes, I saw pandas doing kung fu with some mighty nifty left and right jabs. What’s more, dear reader, I videoed them at it. I have tales of my return to the motherland of my fathers to enthral you here in the fatherland of my mother, but Paul Anderson has written a thorough overview of our China trip so I don’t have to. Yet. When pandas get biblical, we’re living in interesting times. The pandas know. Which is why I’m waiting for the cab to take me to trains and airport. The longest journey begins with the first taxi, grasshopper. I’ll be talking about Anna May Wong and reading poetry from Reaching For My Gnu, published by Aaaargh! Press. Plus I’ll be holding a poetry workshop: Poetry Against the Machine.